Spooky Eyeballs | What Will We Do Today? As I mentioned a couple of days ago, our grand-kids helped me make some spooky eyeballs for Halloween. Click here and you’ll see what we did last weekend. This is a great Halloween project, and suitable for all ages. I’m going to take you through it step by step, but will also give you some tips to help you avoid some of the pitfalls. Not pitfalls, exactly, but things I would do differently if I had only had someone like me tell me what to do!!! Have I mentioned how much I like people to tell me what to do? You don’t really need many materials to make these, and you can whip up a dozen or so fairly quickly. You could also use feathers, or crepe paper or glitter. Let your creative juices flow…. First, find the logo on your ping pong ball. If it takes more than 1 second to find the logo, then it probably doesn’t have one. Now that you have found the logo, look on the other side. Cut an X in the ping pong ball. Put the X in the place with the logo. This part will be on the tea light, so you won’t be able to see it. Because you are plunging a knife into a small, slippery round surface, it really must be an adult who uses the knife. (In fact, it might be better if you had these prepared beforehand). Use your scissors, to turn the x into a small hole. The hole doesn’t need to be perfect. No one will see it. I made the hole big enough so the ping pong ball will set flat on the tea light. We tried doing this with just using an X in the bottom of the ping pong ball, but it didn’t sit squarely on the tea light. See how nice this sits on the tea light? Now, draw the details of your eye (or other pattern) on the ball with permanent markers. I started with the pupil. Then I moved on to the iris. I used my handy-dandy Sharpies for this example, but I used Crayola markers with the kids and they worked beautifully. In fact, some of the markers had a scent, which made our eyeball working environment very aromatic. Nice. Now you can put in the veins. Kevin told me this is easier to do if you just pretend like you are very scared. Then your hand will shake. (He’s so smart). If you don’t want the eyeball to come off the tea light, you can put sticky dots on the ping pong ball. And then press firmly on to the tea light. Now, if you should knock this over, the ping pong ball won’t go bouncing across the floor and under the refrigerator (yes, I speak from experience). Now, if you have time or if you have older kids, or if you just want some gnarly looking eyeballs, you can also try another technique. Feather the paint as it comes around the front of the ping pong ball. When you feather, make sure it can be seen from the front. You’ll see why in a minute. 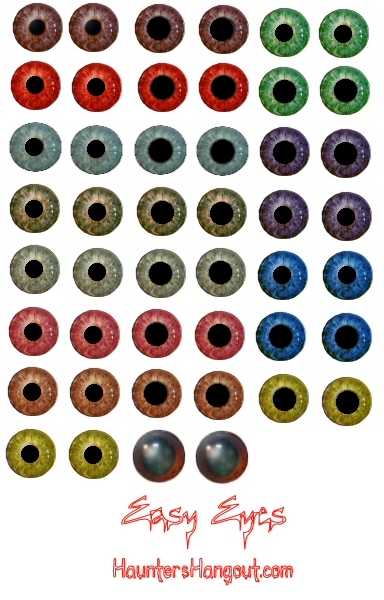 Pick out the color eye you wish for your eyeball. Carefully cut out the eye. Now, you will paint the eyeball once again with the Mod Podge. Be sure to cover the entire ball, including the iris. With your tweezers, pull some fibers from the yarn (see, you really only needed a little bit of yarn). Now you can lay the fibers on the wet Mod Podge. Do this all around the eye. It’s even better with the light on. So, there you go. A quick activity for all ages (yep, including Mom and Dad) and they will look just loverly on Halloween. Unless you are paranoid. You’re not paranoid, are you? Well, just in case, you might want to put hankies over them. I think I might put hankies over them. The eyes do seem to follow you around. But, I’m not paranoid. Really. Not paranoid at all. Not yet. And…you’re not paranoid if someone (or something…or someone’s eyeball) is really following you…right? Right? Both of them are cute ideals. Thanks! I agree…lots of creative people out there, and Halloween certainly seems to inspire a lot of creativity! I remember years ago having to “find” stuff to make spider webs and now you can find any number of spider webs in bags…. Have a great Halloween!! !